The church, occupies the same site as the Roman fort of Danum and an 18 metre stretch of the fort wall can be seen at the north east end of the Minster site..
A Norman fortification is also known to have occupied the site, and it is probable that the materials from that building were used, in part, to build the early church. Jackson’s history of the Church suggests a progression from Early English to Perpendicular styles. 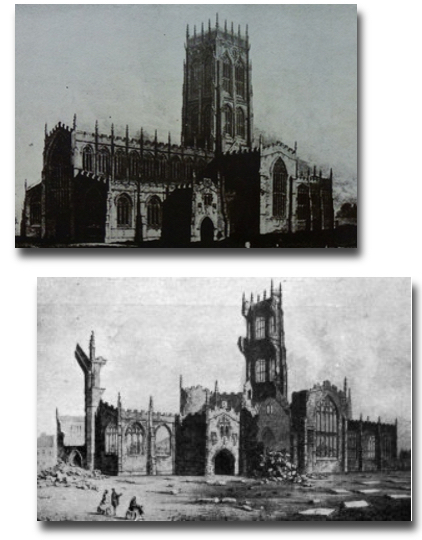 The destruction of the mediaeval church, by fire on the night of 28th February 1853, was seen as a great calamity for the town and the neighbourhood. Nevertheless, within seven days, a rebuilding committee had been formed and raised over £11,000. It is a tribute to the determination of all concerned that it was possible for the Archbishop of York to lay the foundation stone for the new church exactly one year to the day after the fire. The new building, to the designs of George Gilbert Scott, took four year’s to build. Great celebrations accompanied the consecration of the building by the Archbishop of York on 14th October 1858.